His handle is the tip-off. 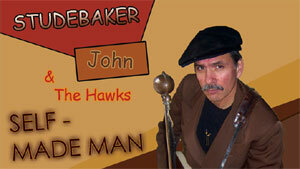 "Studebaker" John Grimaldi is a "class" and classic blues guy from Chicago. Dedicated to the vintage sounds of Chi-town in the golden age of the '50's on guitar and harp, he is no retro man recycling worn-out standards. He makes original music that is both timeless and relevant. With Aaron Ligon on upright bass, Joe Zacklin on a Hofner hollowbody, and Sim cain beating the skins, Grimaldi presented a low-volume set of taut blues on his vintage Danelectro axes. Tuned to open E, he utilized horn-like slide and dynamic fretting techniques in many different keys without using a capo-not something you see every day. His number skirt the obvious 12-abar shuffles and slow blues and tend to be built around vamps with dramatic releases, "Burned by Love" incorporated a hypnotic I-?II-IV vamp over which John tossed off fluid, fingered runs, his nuanced vocals complemented by his thick, but not overly distorted tone. Midway through the 11-song set he put his guitar down and began wailing chromatic and blues harps, showing the influence of Little Walter while also displaying high-register, virtuosic chops reminiscent of Sugar Blue. He closed his enthusiastically received show with the excellent title cut from his most recent Evidence disc, Howl with the Wolf.